The is the first installment in a series of articles that offer advice to newlyweds and new homeowners. Keep checking back for subsequent chapters! So you finally got hitched. Congratulations! Well that was a flash. It seems like just yesterday you and your hubby went to that quaint five-star bistro where he got down on one knee, asked for your hand in marriage and plopped a three-stone on your finger. Before you knew it you were saying “I do” and gallivanting through the streets of Paree arm in arm while a street performer pumped out Mourir d’aimer on his accordion. Oh, sweet as nectar are the raptures of love. The kitchen hasn’t been remodeled since the Nixon administration. So, your first project as a couple will be to renovate the (arguably) most sacred space in your new-old home. You know the phrase, don’t leave me hanging? Well, it doesn’t apply here. 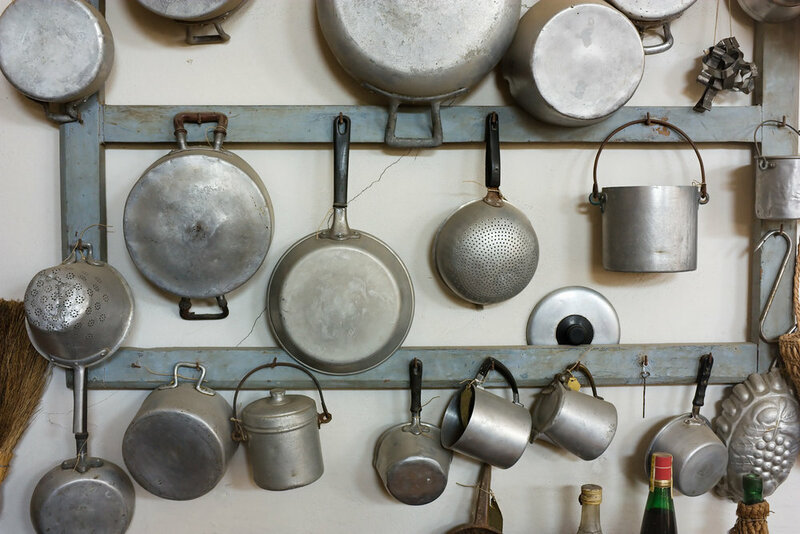 Especially if your quarters are tight to begin with, a great way to maximize on space is to drill hooks and hang pots, pans and other items. But you don’t want to pannihilate them, so try not to overdo it. We believe in you! Hardware is cheap, but new handles and knobs for your drawers and cabinets will go a long way in your kitchen’s transformation from irrelevantly archaic into vintage-chic. Pro tip: Not all hardware is created equal, so if you can find pieces that fit your existing cabinets and drawers, you can avoid having to bust out the drills. Think you can handle it? This one may sound obvious but it’s too imperative to leave out. If you want to make your kitchen look a million times better, give it a fresh paint job. And since you and your new love are young, spontaneous and full of idealism (enjoy it while it lasts), don’t be bland. Go for it with vibrant colors! Furthermore, accent your new paint job with peel and stick mosaics, say, behind the sink. They’re cheap, and easy to install. If there’s one big endeavor you take on during the kitchen update, make it new countertops. Granite and marble are a given, but keep in mind they’re not your only options. Onyx, quartz and soapstone are excellent alternatives, to name a few—it all depends on your style and budget. Either way, once those fresh counters are installed, you certainly won’t take them for granite. Between these tips, a bit of elbow grease and some organization, you can have your kitchen looking like a million bucks in no time. Remember to get creative and to think outside the utensil drawer. If you have an idea, just go for it! And when it comes to the counters, don’t lose your marbles over them. Get in touch with us, and we’ll be glad to help in that department.